Easter day is unknowingly approaching! And that's just how quick the months are whisking by. We were most glad to have attended a Festive Children's baking class by SpurBox, baking cream cupcakes to the theme, Easter. I often rope the help of Js when baking at home. It simply gives a different experience and bond out of the usual settings. Messy it may be, but we know, parenting is sometimes a piece of unavoidable mess. So then when SpurBox invited us to bake with them, I was more than happy to bring the kids down for a session. It was unexpectedly a wonderful time during the class. Most blog worthy of all was that all accompanying parents didn't have to pay any extra to join/bond in the class with their kids. However, kids below 5 are recommended to stay in with an accompanying adult. If your kids are older, you may notify their staff that you are doing a drop off and pick up later. Then go for you kopi break! Upon arrival, we were loaned some props for the session, bunny ears in this case and kids' aprons for the ease of Mummies' laundry time. Other than that, dealing with batter, butter and cream on hair and skin will be termed as, fun baking experience. We had a fun time! The 90 minutes session included baking of cupcakes with fresh cream and fondant, storytelling and craft. It was all hands on with individual stations for each kid. They mixed and made batter, scooped into their lining cups, and the best part was, sticker labels were prepared to help kids label their cuppies before entering the oven. Just how thoughtful it was to label their self made bakes. Some bake classes we attended in the past simply gathered all lined batter and have them unidentified when baked. Little things do matter to kids. While the cuppies were in the oven, the kids were shoved off their stations for a time of storytelling - A tale of Pip the chick. Pip was thirsty and tried to drink water from a pitcher, only to find out that the low water level would not allow him to drink directly from the pitcher. Together and interactively, the kids found out how Pip managed to finally succeed! After which, their workstation was quickly turnover into a station for craft. The kids made Pip the chick! The smell of the cuppies then prompted its readiness! We creamed and decorated them with edibles and fondant. Each kid had 3 chocolate cupcakes to creatively work on. They piped nests and grasses with swiss meringue frosting cream (one yummilicious type of cream), donned on candied eggs and self made fondant chicks. As much as parents like to intervene, we left everything into Js hand. So yeap, their works were as authentic as they were. I could tell Js enjoyed their session tremendously! It was also one rare opportunity for their Daddy to bond with the kids over bake and craft. The session was well-organised, carefully explained and thoughtfully planned. Every part, from beginning to end was well taken care off. The kids were given handheld boxes to keep their works for home consumption. And Js had it for breakfast the next day! I honestly enjoy such bonding session with the kids! And you do need to check out their upcoming March holiday classes too (14th to 18th March), suitable for ages 4 to 9. Ages under or above are welcomed too. Just how they love kids! 9:30am to 12:30pm OR 1:30pm to 4:30pm. Cost: $90 per class or $75 per class for 2 or more sign ups. Aren't they all interesting and unconventional?!! Js are already setting their interest on the Pottery and Shoe making. Sign up and details here. 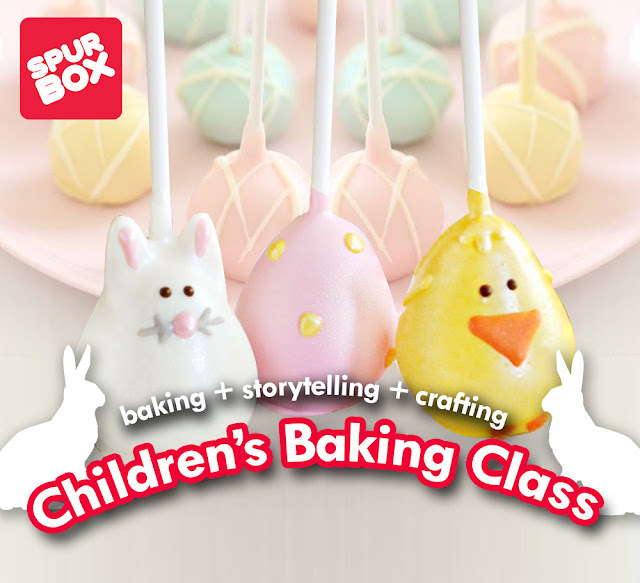 SpurBox is offering readers of Mum's calling 2 pairs of tickets (worth $80 each pair) to their Festive baking class: Pop Pop! Cake pops! A 90 minutes culinary and crafting class, suitable for ages 2 to 7 years old. The 2 winners may choose to attend a class of their preferred date and time. Subject to availability. 3. Leave a comment on this Facebook post telling us which date Good Friday falls on this year. 4. Tag 3 friends whom you think will be keen on this giveaway or are new to Mum's calling. Winners will have 48 hours to respond, failing which a new winner will be drawn. Disclaimer: We were invited to attend this Festive session for the purpose of this review. All opinions and photos, unless credited, are solely ours.